The CDGA Foundation Golf Marathon has been an integral part of the CDGA Foundation’s fundraising efforts, raising over $750,000 in its previous ten years. Funds raised go directly towards CDGA Foundation programming, which utilizes the game of golf to enhance the lives of individuals with special needs, veterans and youth. Participating golfers spend the time leading up to the event collecting pledges from family, friends and business associates. 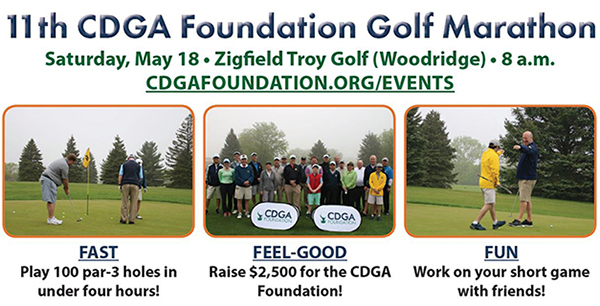 The CDGA Foundation provides participants with tools to achieve a $2,500 fundraising goal. Then, on Saturday, May 18 at Zigfield Troy Golf in Woodridge, golfers will play 100 par-3 holes in a fun and quick fashion. Lastly, individuals who reach the $2,500 fundraising goal will be invited to a year-end party featuring golf and two meals at a private country club. Those interested in participating in the Golf Marathon or donating to a player should contact Alex Nolly at anolly@cdga.org or (630) 685-2351. You can make a contribution to an individual participating or the event as a whole.